HKUST LED-FPD Technology R&D Center at Foshan is an institutional organization co-initiated by HKUST (The Hong Kong University of Science and Technology) and Nanhai District Government of Foshan City. The Center has passed the certification of CNAS qualification. Our main business consists of development and transfer of LED (Light-Emitting Diode) and FPD (Flat Panel Display) technologies for relevant industrial partners in the Guangdong Province. In the meanwhile, our Center also provides technical services such as product characterization and testing, reliability assessment and failure analysis, and technical staff training. Besides, to provide seamless service to relevant enterprises, the center has marched in the Guangdong Semiconductor Lighting Industry Innovation Incubator ( Core Light Source) with a newly open R&D office for High Added Value & Creative LED Products. Our mission is to establish a non-profit making R&D center that accords with the demands of the relevant industries at Foshan and neighboring regions. 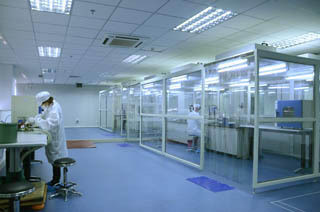 HKUST LED-FPD Technology R&D Center at Foshan aims at extending its influence of expertise on South China by providing services such as engineering research and development, product analysis and prototyping, technical staff training, reliability testing and failure analysis, as well as standardization and qualifications. With the cities of Shenzhen, Guangzhou, Foshan, Zhongshan, and Dongguan as its core, the Pearl River Delta (PRD) of Guangdong Province is an important industrial base and commercial market for LED and FPD in China. The crowding of private enterprises and government investment alongside this region clearly demonstrates the associated geographic advantages and business competitiveness. 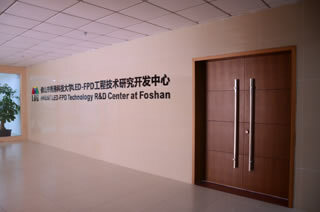 Foshan, located at the central part of Guangdong Province and with all connections to Hong Kong and Macau, is the traditional production and R&D base for electrical light sources. It sparkles in the PRD region due to its comprehensive industrial supply chains and strong government support for the advancement of lighting and display technologies.